A review of the book "The Rocket Men"
The book "The Rocket Men" by Rex Hall and David J. Shayler was published by Springer-Praxis Verlag in 2001, ISBN 1-85233-391-X. 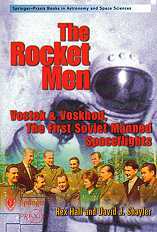 The subtitle of this book is "Vostok & Voskhod, The first Soviet manned Spaceflights". For me, this book reads as a story of my boyhood and adolescence. That is how closely I followed these events. I lived and breathed the space missions. Reading about the real story behind Vostok & Voskhod is therefore an intensely personal experience. "The Rocket Men" is not the only book about this period, just let me mention Asif Siddiqi's "Challenge to Apollo", but it is the most complete about these particular flights. So, for us that grew up with these heroic spaceflights the book reads as a love story. So, I can really recommend this book. However, a review is not complete without mentioning errors, shortcomings and interesting questions raised by the book. Let me start with errors and shortcomings. The use of English units is really irritating. I am surprised that a scientific book published by Springer-Praxis does not use the SI system and instead reverts to the illogical, antiquated and impractical English system of units. In this case, the original data in terms of mass, size and distances were given in metric units and the conversion to English units destroys the possibility of converting back to the original data. Of course, one suspects that the book is aimed at the U.S. book market and the use of English units is a meek surrender by the publishers to the ridiculous notion that well-educated Americans cannot understand metric units. I think the authors are innocent in this respect and this irritating aspect of the book is only that, irritating, and does not turn the metric reader off. I think that the book would have benefited from a note system with source references. It is published by a science publisher, isn't it? In the account of the Voskhod-2 dramatic recovery (p.249), the book says that a 46 seconds delay of retrofire led to a 2000 km overshoot. Pure orbital motion during 46 seconds leads to a 360 km overshoot, not 2000 km. The picture on p. 124 does not show a biological canister from a high-altitude rocket flight as the caption says, but rather the ejection seat of Vostok with a dog-cabin installed. If the picture was taken at the end of an actual flight, the summer-like weather would point to the recovery of Strelka and Belka on KS-2 (Sputnik-5). I have always wondered why the early Vostok test flights had such high orbits. What was the point in flying KS-2 (Sputnik-5) in same high orbit as KS-1 (Sputnik-4)? KS-3 (Sputnik-6) had new system for physiological TM (p.128). Could that have been the shortwave beacon system for transmitting heart rate used on the Vostoks? Unfortunately I do not have access to any recording of the shortwave beacon from Sputnik-6. Did really the Nedelin disaster affect the schedule for the manned program? It seems so from various accounts. Was there any technical reasons behind this, or was it a purely political consideration - the leadership of the missile/space program felt vulnerable after a string of failures in the fall of 1960? On p. 137 the book says that the Brezhnev inquiry commission convened after the Nedelin disaster recommended delaying the manned launch due to the changes necessary after the 24 October 1960 Nedelin disaster. What changes? The Nedelin disaster had to do with an entirely different system. I am not entirely up to speed on the location of all controlrooms for all early space missions, but I understand that there was some kind of control center in Moscow for Gagarin's flight, but was it really called "TsUP" (p. 149)? Also, I understand that the main mission control was at Tyuaratam, wasn't it? Gagarin never said that he was over "the continental U.S.A." (p.153) He said that he was "flying over America", which was almost correct. He was approaching the southern tip of South America. The book mentions that Vostok-3 HF transmissions were relayed by Soviet fishing trawlers off the US Eastern seabord (p. 184). Really? I doubt that one would have entrusted semi-civilian vessels with such an important task. I can agree is the sentence reads "Soviet converted fishing trawlers". The Soviet ground system was primitive but not as primitive as the text seems to convey. Did the Vostok-4 flight really end early because of a misunderstanding in using code words (p. 191) (Popovich said he was observing (real) "thunderstorms" and this happened to be the code word for a desire to be recovered promptly)? If this was the case it really shows the dangers in using code word so close to actual flight events. To me the story seems fantastic - but you never know - reality can sometimes be more fantastic than fantasy! It is interesting that the launch date for Tereshkova's flight was detrmined only after Vostok-5 had entered orbit. (p. 206). I have always been under the impression that Vostok-6 should have been launched the days after Vostok-5. Any evidence of that? Also, why were the orbits of the two ships not co-planar as in the case of Vostok-3/4? Was there a delay during the countdown of Vostok-6 that led to a delay of exactly one orbital period (to make the spacecraft stay close, but not co-planar)? Was the retro-fire duration of Voskhod 1 really only 2 secs long (p. 226)? Wasn't that the burn time of the back-up engine? Foton's "Nauka" module (p.274) is actually an auxiliary battery back if we can believe the Russian documents published in connection with ESA's use of this space vehicle.